This is the latest in the powerful Avolite Diamond 4 Vision Series, the new generation of top-level lighting control from Avolites. The streamlined, stylish and aesthetically pleasing profile of the Avolite Diamond 4 Vision reveals a lighting console that’s intuitive to operate, offers minimum operator fatigue and the ability to create the fastest, most cost-efficient, stunning shows. This Avolite Diamond 4 Vision is designed for large-scale shows, festivals, concerts, events and multi-purpose venues. It addresses the needs of lighting designers needing fast, accurate and immediate control of numerous intelligent lights, conventional fixtures and other DMX devices. The Avolite Diamond 4 Vision builds on other consoles in Avolites’ Diamond 4 Series – the D4 Classic and the D4 Elite, incorporating yet more groundbreaking features. 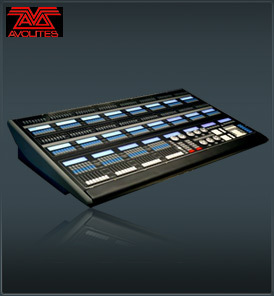 Avolites - after intensive user research - has designed a console that is equally at home in live ‘hands-on’ situations as it is in more controlled ‘pre-programmed’ environments. The Avolite Diamond 4 Vision addresses the whole spectrum of production situations. For those with more time - and possibly with a designer away from the console - the Vision’s newly designed programming panel allows the entry and selection of fixtures and palettes by number, whilst the electronic palette gives entry by legend. These entry systems can be mixed in any way, and are always available simultaneously. New features include the Command Syntax which allows replaying of the last entered button presses, and the storing of these for later use. The new processing engine ensures that response times for selecting and running anything are fast and seamless. In addition to the 24 high resolution graphic LCD screens, dual high resolution colour monitors ensure that the D4 Vision’s information is presented and formatted in an easy-to-understand-style. All data is stored on the console’s hard disk, and can be backed up onto floppy/CD or copied via the Ethernet connection to a PC. The Avolite Diamond 4 Vision retains the Avolites tradition of being built-to-last in all respects. Robust physical construction is coupled with full upgrade-ability using the in-built modem for Internet connection whenever and wherever required. Avolites – making light work everywhere. A Preset Fader can now control a chase, cue, list or fixture intensity. D4 is now fully configurable. 128 preset fully legended preset faders, configurable as Fixture Masters or Cue Masters, 200 pages. 200 pages of 128 Direct Access Programming Palettes. Multiple Times on Attributes & Fixtures. Logical, informative Cue Viewing Environment. Dedicated buttons for Theatre Plotting features. Electronic legending for Palettes, Groups, Fixtures, and Cues. Fully automatic configuring of Palettes and Groups. Dual Theatre and Multiple Cue List playbacks. 8 DMX lines built in, additional lines using Ethernet. Powerful Shape Generator, Fan and Highlight functions.